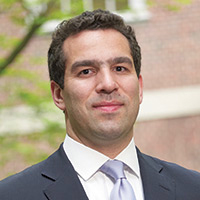 Zachary K. Goldman is an Adjunct Professor of Law at NYU School of Law and a Senior Associate at the law firm WilmerHale, where his practice focuses on cybersecurity, national security law, financial sanctions, anti-money laundering, and related areas. From 2012-2018 he was the Executive Director of the Center on Law and Security at NYU School of Law, during which time he co-founded NYU’s Center for Cybersecurity, and was a founding director of the MS in Cybersecurity Risk and Strategy. Zachary previously served in government as a policy advisor in the US Department of the Treasury’s Office of Terrorism and Financial Intelligence, where he was the subject matter expert on terrorist financing in the Arabian Peninsula and Iran, and as a Special Assistant to the Chairman of the Joint Chiefs of Staff at the US Department of Defense. He has published on national security strategy, financial sanctions, cybersecurity, counterterrorism, and US foreign policy in outlets such as The New York Times, Foreign Affairs, Lawfare, Political Science Quarterly, Cold War History, The Atlantic, The Diplomat, The National Interest, and others. He is the co-editor, with Samuel Rascoff, of Intelligence Oversight: A Global View, an edited volume on comparative approaches to intelligence oversight, which was published by Oxford University Press in 2016. Zachary is a Term Member of the Council on Foreign Relations, and an Adjunct Senior Fellow at the Center for a New American Security. He received his JD from New York University School of Law, his Masters in International Relations from the London School of Economics, and his BA from Harvard University.